Local sports fans looking to quench their thirst in area stadiums know Clarence Haskett by his nickname Fancy Clancy. And now, a new brew honors the hardworking beer vendor who's been selling beer even before he was old enough to drink it. A superstar beer man who’s been serving fans cold ones at Baltimore Orioles games for 45 years just got the ultimate compliment: his own beer, now served at a local brewery in Winchester, Virginia. Most people know Clarence Haskett by his nickname Fancy Clancy. Besides O’s games, you’ve also seen him in action at Nats, Redskins and Ravens games. Haskett started vending when he was 15. “It has kept me in pretty good shape most of my life,” he said. Major is also the owner of Escutcheon Brewery in Winchester, Virginia. So the two have collaborated to create Fancy Clancy Pilsner, a classic American style pilsner with a little extra flavor. “Our target was to get a baseball beer. Something that a lot of people would like, universally accepted, and … not too high in alcohol content so it doesn’t knock you out after one,” Major said. 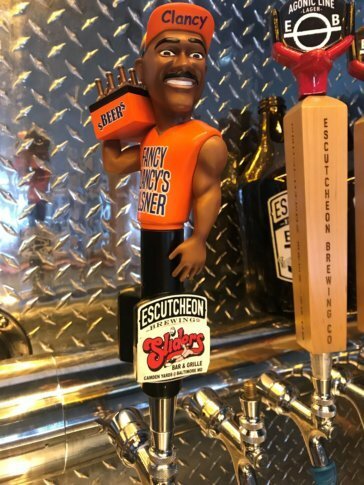 Fancy Clancy Pilsner is only available on tap at Escutcheon Brewery and in some bars, mostly around the Baltimore area. The design of the tap handle captures the beer man in miniature. “It’s the iconic Clancy. He’s known for wearing his baseball cap with the bill turned up with his name on it, so if somebody wants to order a beer they know to yell Clancy. Sleeves rolled up, carrying a case of beer. We did add a little extra muscle to the arms for aesthetics … and maybe to encourage him to work out a little more,” Major said. The brewery hopes to start selling the beer in cans sometime in the next couple of months. You won’t find Fancy Clancy Pilsner at Camden Yards right now, but who knows, maybe Haskett can sell it there someday. Haskett celebrates his 60th birthday April 5. “Do you know what’s really amazing now? I have people come up to me and say, ‘Hey Clancy, I’m going to be 21 on whatever date, and I want to come to the game, and … I want to buy my first beer from you.” And come to find out, that person is probably the child or the grandchild of a person I sold beer to in the late 70s,” Haskett added.